Technology for processing texturized food service products with a unique bite. Technology for inline analysis of feed & food products without human intervention. UNIQUE TECHNOLOGY SOLUTIONS FOR THE FEED AND FOOD INDUSTRY. To meet the higher demand for our products and to simultaneously be able to provide even better support to our customers, Source Technology has moved all of our operations, including production, R&D, test center, and administration, to a single site. Source Technology continuously holds demonstration days, where we manufacture different food products based on the PowerHeater technology. 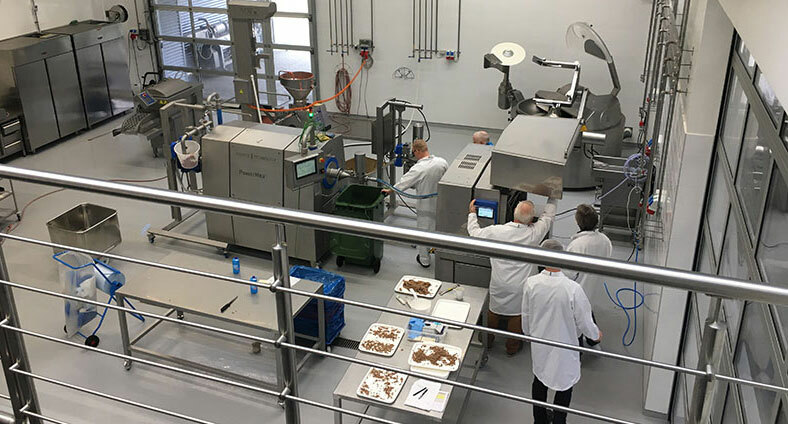 By taking part in the demonstration day, participants will have the opportunity to view both meat and plant protein-based products as well as gain detailed knowledge into the PowerHeater technology. Short curing time combined with a fully-automated process for processing an alternative to traditional diced cooked ham. This novel ham product represents a new generation of cooked ham. No manual handling, low carbon footprint, short curing time of only two hours, and irregular, natural-looking chunks. New AQA™ Inline Analysis machine for measuring moisture & water activity. The new AQA analyzer is operated without calibrations and is based on very reliable measuring principles. Source Technology offers a fully-equipped demonstration center. This training and demo facility is designed to bring experts together so that they can experience the full potential of the PowerHeater equipment. Develop new formulas & products or test processing equipment in our state-of-the-art test center. Source Technology also offers to manage our customers’ R&D projects. The Source Technology training program set up to support you and your organisation with technical knowledge and know-how in order for you to maximize machine performance and efficiency. Training during commissioning of the PowerHeater, is conducted by our experienced Process Engineers. The training ensures that our customers can obtain optimal performance of the equipment. With service and support from the people who know your equipment the best, you can enjoy total peace of mind. Our dedicated service personnel are always ready to solve your problems. The Source Technology Service Team is set up to support you and your organization with technical know-how in order for you to maximize performance and efficiency. Our offer does not only cover management of our customers’ projects. We can also manage the installation and fine-tuning of the processing equipment. We are thereby a true speaking partner for our customers. We offer to design, execute, install and maintain the processing facilities. Sign up for our newsletter and get up to speed on the latest news and products.